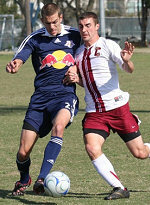 A lone goal from defender Eric Brunner was enough for the Red Bulls reserves to defeat the College of Charleston, 1-0, in Charleston, SC, Monday. In the 71st minute, Brunner was able to latch on to a knocked down corner kick and hit a deflected shot into the back of the net for his second goal of the preseason. The Red Bulls had two scoring chances in the first five minutes with Ricky Schramm hitting a shot high after breaking through on the right side. Two minutes later, Schramm was able to get a shot on goal from a John Wolyniec pass, but the attempt was saved by the goalkeeper. Since the Red Bulls did not have any bench players, assistant coach Richie Williams came on for Chris Leitch in the 55th minute. Also, due to an injury to the College of Charleston goalkeeper, Red Bulls keeper Danny Cepero played for the Cougars in the second half.